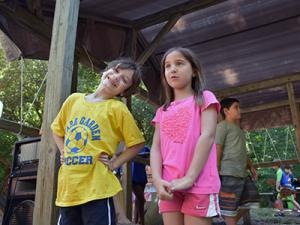 The drama program at Miquon Day Camp is comparable to an experience at traditional theater camp and is inclusive of every camper . . . even campers who shy away from the stage. Our philosophy is to create an environment that supports every interest and inspires every imagination to dream the wild, over-the-top dreams that only campers dream. Then, we turn those dreams into lines of dialogue or cardboard props or papier-mâché set pieces and after 4 weeks of camp, we host an original Miquon Day Camp production that children and families look forward to each year.